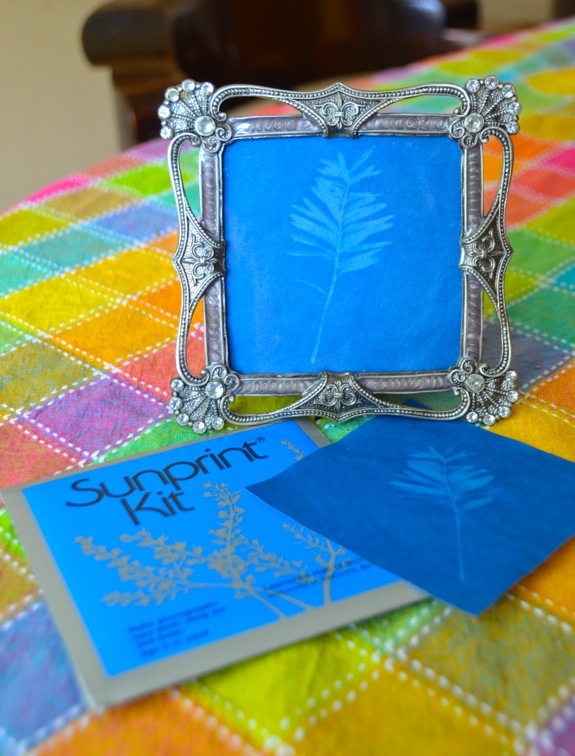 The girls and I made some pretty botanical prints with the help of the Sun, some water, and a Sunprint Kit similar to this one. They were so proud of how nicely their prints turned out! We used natural items we collected from our yard — sticks, flower petals, and leaves. Be sure to remove the paper backing from the acrylic sheet. The prints appear, then disappear. Then they reappear much later as the paper dries. We did three sunprints as a trial run, and I almost threw them all away because I thought we had somehow messed them up! They are lots of FUN to make and an effective way to demonstrate solar energy, and easy homemade photography! For more crafts and activities that celebrate the Sun and all that is sunny, click here! I have been meaning to do this! Thanks for the reminder. It is beautiful! I remember doing this as a kid and thinking it was the COOLEST thing ever!